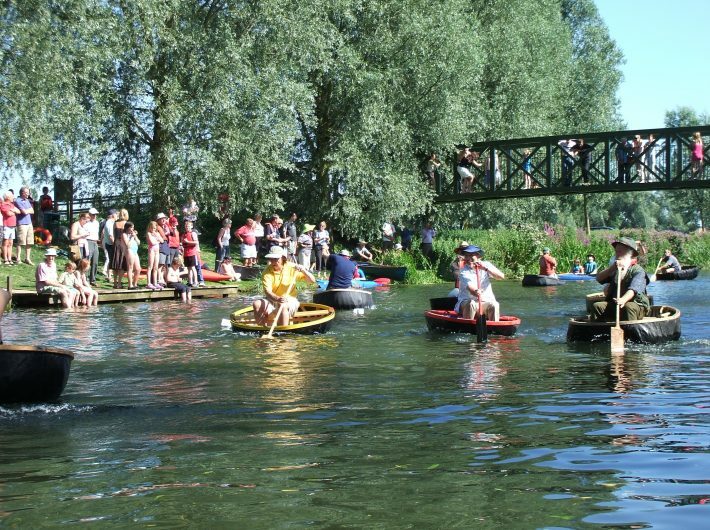 Organised by coracle owners with support from the River Stour Trust to offer everyone an opportunity to try to handle one of these unusual craft.The ‘coraclers’ not only share their craft but spend time explaining the best way of moving along the river. If you own a coracle but would prefer not to share it just bring it along and join in the fun! Camping for coraclers is available at Rushbanks Farm, Bures Road, Wissington, Suffolk, CO6 4NA.People of all ages can have a go and some get wet! Life jackets are available and there are safety boats on hand. Spectators are kept entertained throughout the afternoon by races such as the ‘Poachers Run’. More info: http://www.riverstourtrust.org Proceeds towards the restoration and conservation of the River Stour Navigation.